Over the last several years, the concept of the home office has grown in popularity as more and more people bring their work home with them or work from their home-based office. 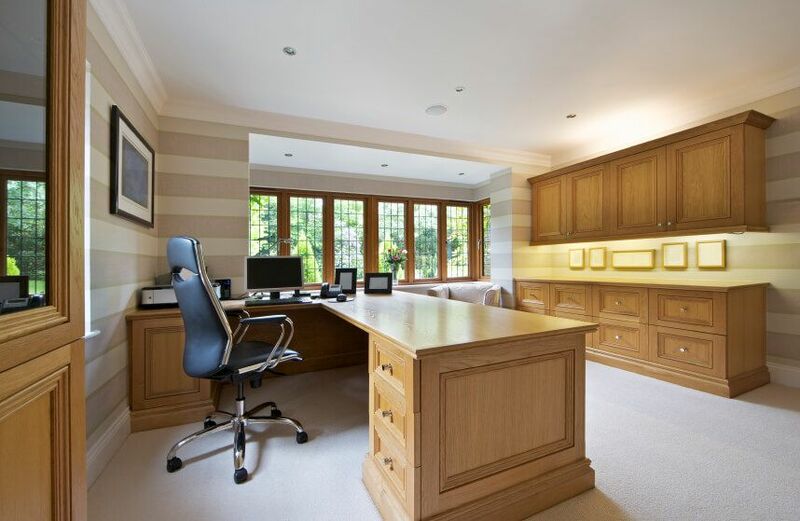 Cabinets are usually a necessary feature for a home office. Want something a little different? Consider installing counters along your office walls that feature cabinetry beneath or above them – they can keep items like computer supplies, printer paper, arts and crafts supplies, and other office-related knick-knacks organized and in place. Aside from cabinetry, consider a custom-designed display area for showing off personal accomplishments or treasures like awards, trophies or rare collections of pottery. Display cases also can include lighting features, adding unique, aesthetic interest to the room. Innovative workstation solutions are transforming the look of the home office so that the traditional “computer desk” is no longer needed to house ceiling-high computer towers or enormous technology gadgets. Thankfully, today’s computer gear is much more compact and sleek; your work area can be customized to the “way” you like work, as well as the type of equipment you prefer to work with. There are many styles of built-in bookcases that are both functional and visually appealing. By building a bookcase from scratch, you can personally select the type of wood, finish and other decorative features, including trim. While bookcases are naturally (and obviously) designed to hold books, they can also provide a great ornamental element to your home office. Finally, built-in bookshelves tend to boast a look of professionalism that will be impressive to any clients who may visit your home office. When it comes to home office color choice, monochromatic color schemes – black, white and grey – are definitely trending at the moment. Design experts say these basic colors are extremely popular now because they are flexible, attractive and professional. Additionally, decorating with a monochromatic color scheme can make it easier to find furnishings and technology that complement your overall décor. If you’re hoping to remodel a space in your home, and turn it into a comfortable, functional, aesthetically pleasing work area, contact Republic West Remodeling today.